Strange the Dreamer is possibly one of the most anticipated books in the book universe this year. Thanks to the hype I was super excited to get my hands on it despite still not having read Laini Taylor’s trilogy. It’s safe to say that I was completely sucked into this magical world and I completely understand why so many readers are big fans of Laini and her books. This book is a tale of dreams, myths and fantasy. Lazlo Strange is a dreamer, in fact some call him Strange the dreamer. He dreams of the mysterious Weep and knows just about everything there is to know about the long deceased city. Lazlo thinks his passion is a fantasy until the day some strange visitors take him on board and Weep becomes his reality. Lazlo’s passion for Weep was so infectious that it didn’t take long before I needed to know absolutely everything I could about it and I was not disappointed! Reading Strange the Dreamer is a truly magical experience. Laini Taylor manages to breathe magic and mystery into every sentence, weaving together a beautiful tale full of emotion. As the story of Weep’s history unfolds it is easy to feel the pain of its citizens. Laini uses her words to create a world that will mean something to her readers. Not only is this book atmospheric, it is emotionally charged and touching. I urge you to reread the prologue once you’ve finished this book and then you will truly grasp just how much of a genius Laini Taylor really is. I loved the characters so much! Lazlo is so dreamy! He is obsessed with books and knowledge, he is sweet and caring, he doesn’t judge others but is open to the world around him. He is such a darling and I LOVED how his character developed right up until the end. Also my mythical blue babies: Sarai, Sparrow, Ruby, Feral and Minya. Sarai and Minya were by far my favourites but this is probably just because we get to know more about them. Sarai just repeatedly broke my heart, I loved her and her moths. She seemed so genuine and she easily became a favourite of mine. Minya is just deliciously evil and I am all about those kind of characters!! Her role at the end of this book really made me excited for book 2!! With a whole new world to learn, this is initially quite a slow read as you get to learn the relevant vocabulary, locations and mythology but once you are familiar with those you won’t be able to put this book down. The plot is driven, the characters are wonderful and the world is so well written and unique. I loved everything about this book and if you like fantasy novels with exceptional world building and mythology then you’re guaranteed to love this! 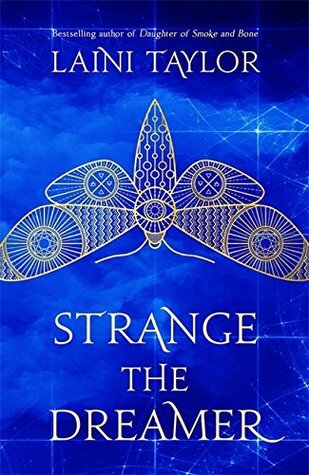 Have you read Strange the Dreamer? What did you think? Fantastic review! This sounds lovely. I can’t wait to read it. I’ve been waiting for your review for this one! Ahhhh this book is receiving so much hype. I actually haven’t seen a bad review for this one yet. Hahaha I see what you did there 🙂 I do love a good pun. Glad you rate it highly. On my TBR pile. Important for main characters to develop and change their ideas through the narrative. I skimmed bc I want to read this…but I’m glad it is a five star review!! Whoo hoo!